Through the first half of November, the Washington Capitals were unable to string together wins, let alone goals. 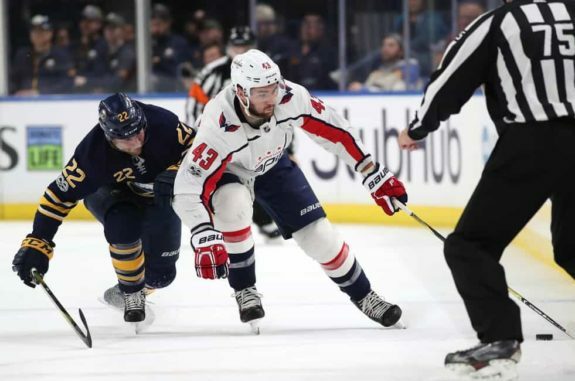 They couldn’t find true chemistry throughout their lineup, making it easy for head coach Barry Trotz to make some changes to the forward lines. To ignite a spark, Trotz shuffled the forward lines, reuniting Alex Ovechkin and Nicklas Backstrom, one of the NHL’s most dangerous duos over the last decade. While this change has been the most significant, given the increased scoring from that top unit, there was another unlikely addition that has proven to work for the Caps: Tom Wilson, Washington’s designated tough guy and known fighter, has joined that top trio. The 23-year-old winger has just two goals and eight points through 22 games so far this season, but over the last four games, Wilson is not only taking on more responsibility, skating 16-18 minutes a night, but he is improving as well. Since joining Ovechkin and Backstrom on the first line, Wilson has registered an assist and two shots on goal, and he is a plus-3. Backstrom also believes that the line changes were necessary, and ultimately, it worked out or the best. Wilson’s playing style resembles that of an enforcer — he is best known for hard hits and bringing physicality to the ice. When it comes to the top line, he brings many different factors to the table, but bringing energy and fighting for pucks are among his top priorities. While Ovechkin and Backstrom both have a unique bond, Wilson brings a different style of play to the table — he doesn’t rely on fancy stickhandling and quick shooting. Instead, his physicality and ability to win battles for the puck and create space for his linemates is what makes him a strong asset to the first line. Not only does Wilson provide physicality and a more aggressive style of hockey, but Ovechkin also said that he has seen the former 2012 first-round pick impress and show a lot of skill in practice, as well as in games. In fact, one excellent play came on Friday against Tampa Bay, where he made an impressive cross-ice pass that landed right on Ovechkin’s stick, leading him to a one-time goal for the captain. 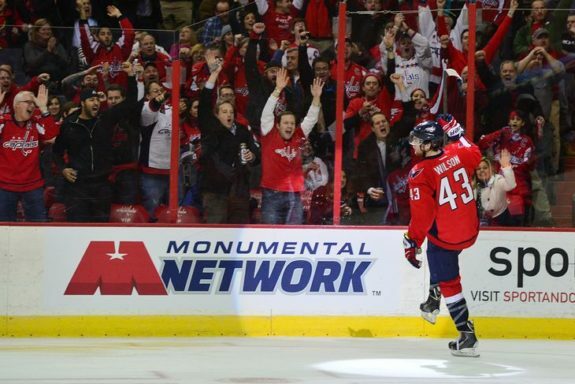 “He have a skill to make those pass, make those plays,” Ovechkin added. Trotz agreed, saying that Wilson’s physicality is something that truly brings a lot to the first line and helps create more chemistry on that unit. Overall, Wilson is excited that he is getting the chance to play on the top line, and he feels he is learning a lot and adjusting well to more ice time and increased responsibility. During games, Wilson said that he learns a lot and gets feedback from his linemates and that they all communicate well during their shifts, despite their different playing styles. As he looks to keep his spot on the top line and continue to spark offense and consistency throughout the lineup, Wilson plans to keep elevating his level of play. “I just try to keep the energy high and keep my feet moving and get in on the forecheck to go into the dirty areas and make a play when it needs to be made,” Wilson said.